The Civil Service Commission (CSC) administers the Fire Officer Examination (FOE) for those who would like to join the Bureau of Fire Protection (BFP). For this year, the FOE has been scheduled on June 17, 2018. Those who would like to take the examination may secure and file their application forms at the CSC Regional Office (CSCRO) or download and print it from the CSC’s official website. Only applications with complete application documentary requirements must be submitted. All applicants must be (1) a Filipino citizen, (2) of good moral character, (3) mentally and physically fit, (4) must not have been convicted by final judgment of an offense or crime involving moral turpitude, or of disgraceful or immoral conduct, dishonesty, examination irregularity, drunkenness or addiction to drugs, (5) must not have been dishonorably discharged from military service or dismissed for cause from any civilian positions in the government, (6) must possess a baccalaureate degree from a recognized institution of learning, and (7) must be 21 to 35 years old at the date/time of filing of application. Although there is an existent age requirement, it shall be waived for incumbent and former employees of BFP, granted that they are endorsed by the BFP and they can meet the minimum service requirement according to the existing laws. They should present Certification of Employment issued by the authorized agency official. An application endorsement by the authorized BFP/BJMP official with a statement certifying that the applicant can meet the minimum service requirement pursuant to existing laws should also be presented. For applicants with dual citizenship under RA 9225 (Citizenship Retention and Re-Acquisition Act of 2003, they may apply and take the exam upon presentation of original and copy of Certification of Retention/Re-acquisition of Philippine Citizenship from the Bureau of Investigation. For applicants with pending administrative and/or criminal cases, they may be eligible to take the examinations, but this is without prejudice to the outcome of their pending cases. If found guilty, they may be still be forfeited. WATCH: Pasig city remote controlled Firefighting Machines. Meanwhile, those who already passed examinations given by the Supreme Court of the Philippines (Bar Exams) and Board Examinations conducted by the Professional Regulatory Commission are automatically granted eligibility according to RA No.1080. Note: The spaces for “Signature of Applicant” and “Right Thumb mark” on the Application Form should be left blank. These shall be accomplished in the presence of the CSC processor. Note: All other I.D. cards not included in the above list shall NOT be accepted. For those with IDs not indicating their birth date, they need to bring an original and photocopy of Birth Certificate issued by the Philippine Statistics Office. 4. Examination fee of Seven Hundred Pesos (PhP700.00). 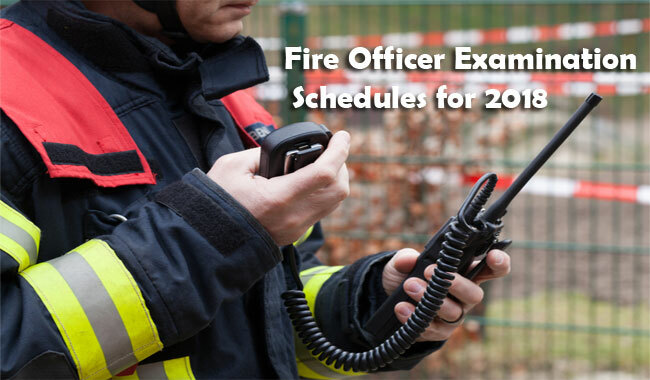 NOTE: The Testing Centers for the FIRE OFFICE EXAMINATION 2018 is yet to be announced. Administrative Matters (10%) – RA 6975, RA 9263, RA9592, CSC Rules and Regulations and Qualifications Standards, BFP Memo Circulars and SOP on Administrative Matters. Fire Investigation (15%) – The Law on Arson in the Philippines (RPC); Constitutional Rights of the Accused, Prima Facie Evidence of Arson, Rules of Court; Procedure and Techniques; SOPs on Fire and Arson Investigation. Exam takers should get a general rating of at least 80.00 to pass the examination.